You’re Ready to Move Forward; We’re Here to Sell Your Home For You! You deserve a smooth experience selling your home. Let our Certified Residential Specialist help you make it happen. Something’s changed in your life and now your home no longer fits like it once did. Exciting days are ahead and your next home is going to play a big part in that. The last thing you can afford (financially or mentally) is a mortgage on a house you don’t live in or worse yet, an unsold home stopping your move altogether. We help all sorts of people whose housing no longer fits their lifestyle. We listen to their needs and get them out of their current place and into just the right house so that home can be a place they want to be. If you are considering using an agent to sell your home, be sure to find out their Real Estate Batting Average – on average, we sell homes for 99% of the original list price and within 26 days of listing. If that sounds good to you, then we would love to meet you for a no obligation home assessment. 1. Schedule a no pressure appointment. 3. Let’s execute the plan together. 4. 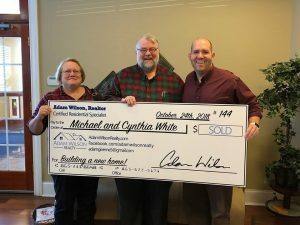 Celebrate with your name on THE BIG CHECK!